Something that really winds me up is the ‘so called’ simple Nutritional Advice labels the front of food packaging. Quite often it will state that a food is low in Sugars. It might be low in ‘sugar’ as an ingredient but it most definitely isn’t when it’s on something like Bread or other high carb foods. All Carbohydrates turn to sugars in our bodies, so, these labels should really be saying High Sugar content. For example, an average slice of bread contains about 30grams of carbs per 100g. That means 30% of bread is sugar. That’s very High. Now see this example of a bread label (above) which says 2% sugars. They should take into consideration the amount of carbohydrates in the food, not the actual sugar content. This is particularly bad for someone thinking they’re following a low sugar, ie. low carb diet and wondering why they’re not losing weight. All carbohydrates are pretty much the same. 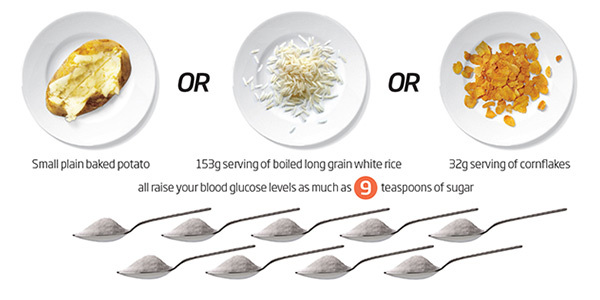 A Baked Potato, a serving of Boiled Rice or a small bowl of cornflakes all contain the equivalent of 9 teaspoons of sugar for your blood sugar levels. This will be slightly less for Carbohydrates with a low glycemic index as they won’t raise your blood sugar levels as much but it’s a good rough guide. We just don’t know about the invisible sugars and that is why so many people who are obese but say they don’t eat much, just don’t realise how much sugar they are actually eating per day. Hypothetically, imagine you only ate three bowls of cornflakes a day as below, thinking you were dieting. With the milk and sugar added to them, you would be eating about 36 teaspoons of sugar per day. That’s about 180 grams of sugar per day. Your poor pancreas.